I had the pleasure of talking all things urban chickens with a group of people who were participating in the 24th Annual Secret Gardens of the East Bay tour over in Oakland yesterday. It was a delightfully beautiful Spring day outside (sunny, mid-70s) and I was impressed that the group of about 30 or so people actually chose to cram into a small classroom to listen to me and ask good questions. 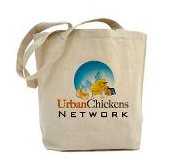 BackyardChickens.com - a strong online community of backyard chicken enthusiasts and just about any question you have about the cluckers, someone at BYC will know the answer. MyPetChicken.com - a wonderful online source for small quantities of just the breed of chicks you're looking for. They've got lots of other good chicken supplies and paraphernalia, too, and don't forget to consult their Chicken Selector Tool to help you narrow down your choice of chick! FeatherSite.com's Poultry Page - While it hasn't been updated in over a year, the content about chickens is timeless (and rest assured chickens haven't evolved enough in the meantime to warrant any updates). And a big thank you to Nina for coordinating the speaker series and the gift of the awesome Slice of Organic Life book. I can't wait to put the ideas in the book to practice! Finally, be sure to check out the Poulet Chalets article in yesterday's San Francisco Chronicle. It covers much the same information I did in my presentation (but it's in handy-dandy written form). FeatherSite.com has been my bible for my chickens from day one. My biggest education on identifying and raising chicks has come from there. Granny Annie, you've been my go-to person on all things chickens since I first started out, so your endorsement of FeatherSite.com is high praise indeed!